← Earliest Arctic Minimum On Record? 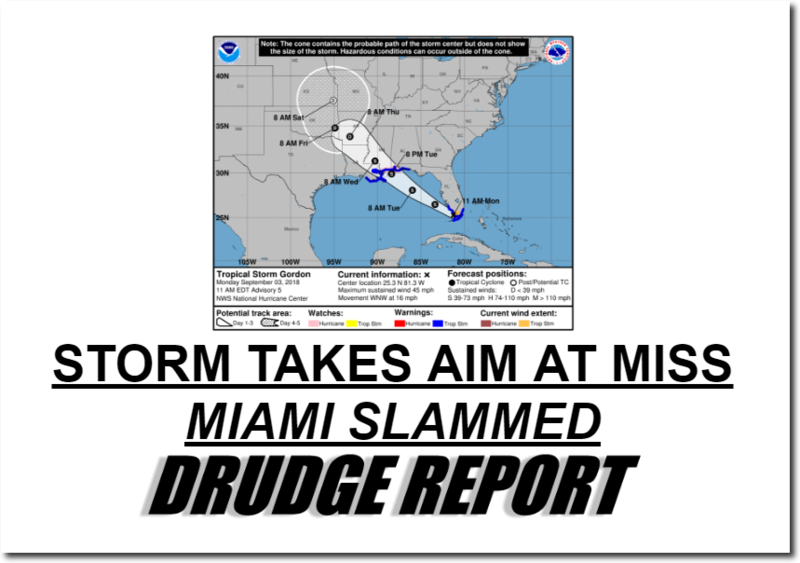 Drudge says Miami was slammed by a storm. 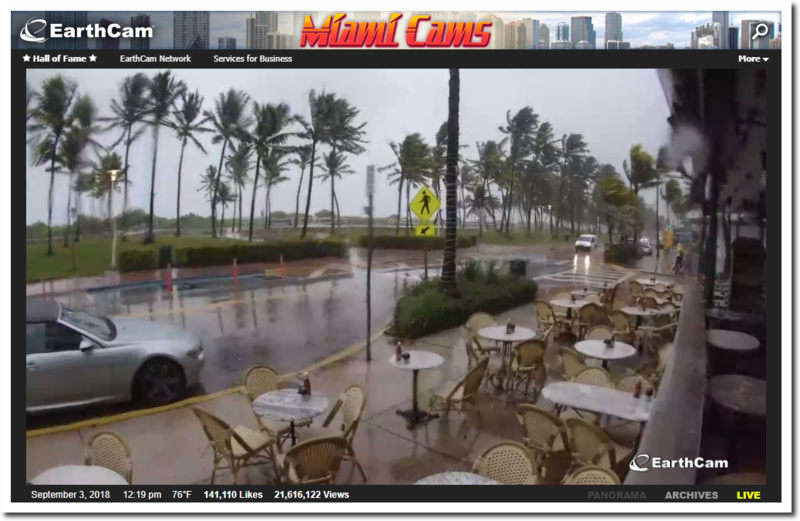 This is what Miami looks like this afternoon. 21 Responses to Can Miami Rebuild? Did Matt recently hire a British tabloid headline writer? The KMIA weather shows max wind as of 1153 at 28 mph/G 41 mph (not kts), with heavy rain. As of right now even less action at Naples on the west side of the panhandle. Reads like an average tropical depression left its calling card. Not likely to become a hurricane but still George is a TS though is not showing much circular rotation due to prevailing west winds. Never something to get worked up about around S. Florida and the keys unless you wanted to go boating. Chairs,bottles and tables in Miami seems to have an average weight of 200 pounds. As this is the only explanation why they haven’t been blown away by this “storm”. There were several screen-snaps on the webcam that showed the chairs at the table being laid flat by …. people. than the snowleopard and indian rhino combined. Drudge changed their headline. Glad they did. The low information types are liable to stick around when they should evacuate when news organizations overhype storms that turn out to be duds. every day above freezing a prove for global warming armageddon. As of 8:00 eastern, GFS model shows no cyclonic action, but rather a tropical wave, with winds in the hottest zone of 39 mph. See below, as visualized by ventusky.com. 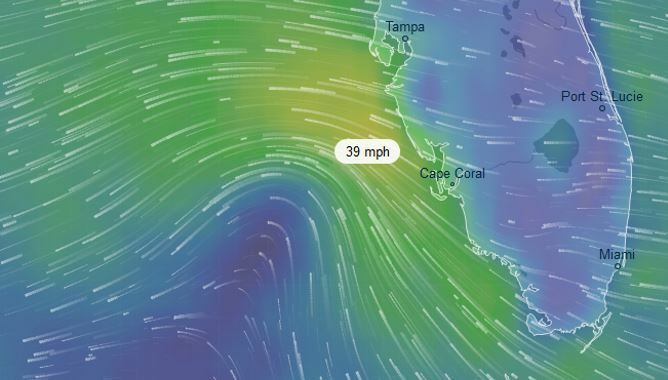 The storm intensifies as the evening progresses, with the models connecting the 10-metre winds into an oval about 4:00 am EDT. From there, the storm takes off NW, gaining strength and speed over the water. At 9:00 tomorrow night, with the center of the storm just south of Mobile, top winds are 58 mph. Landfall looks like 10:00 pm, right at the AL/MS border, with potential storm surge in Mobile Bay. Strong southerly winds continue onshore overnight, and by 6:00 am Central time Wed, the center of the storm is in mid-south MS, and by 3:pm Central, straight west of Jackson MS, over the Mississippi River. The storm moves progressively NW, and weakens as it goes. By Thu night, the cyclonic motion is breaking down, but the ‘wave’ is still providing 7-10 mph winds from the SW into Little Rock, and on the West side, from the North into Dallas at 5-8 mph. By then, folks will likely be wondering about the Cyclone in the mid-Atlantic. That new mid-atlantic cyclone, which, while, getting good winds, does not move very fast, but it is joined by some other low pressure systems, all disturbed by strong Jet Stream motion in the 500-300 millibar elevations. We will see what happens to them, other than dissipating huge amounts of North Atlantic Ocean heat. Those sky high property prices! Coincidence? 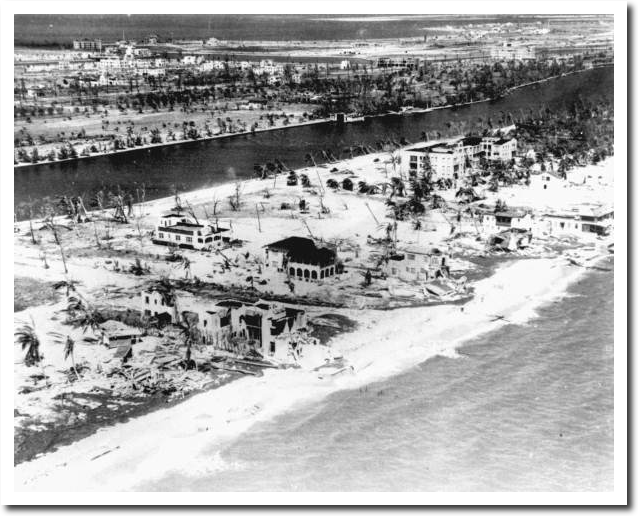 A reminder that modern day “hurricanes” don’t actually register hurricane force wind on land…they register such winds at altitude where people’s property insurance rates are now. 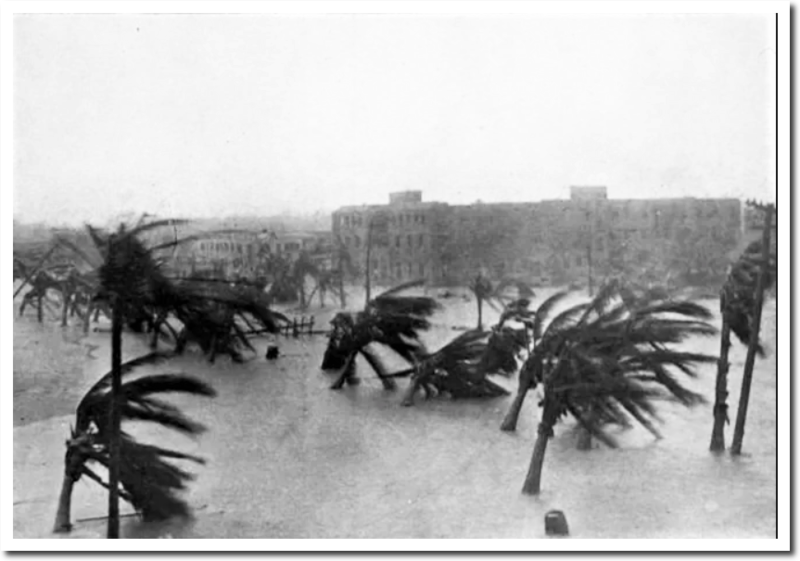 This is unlike historical hurricanes which blew trains off tracks, created new inlets, destroyed whole islands, flattened cities, and blasted buildings down to their foundations. 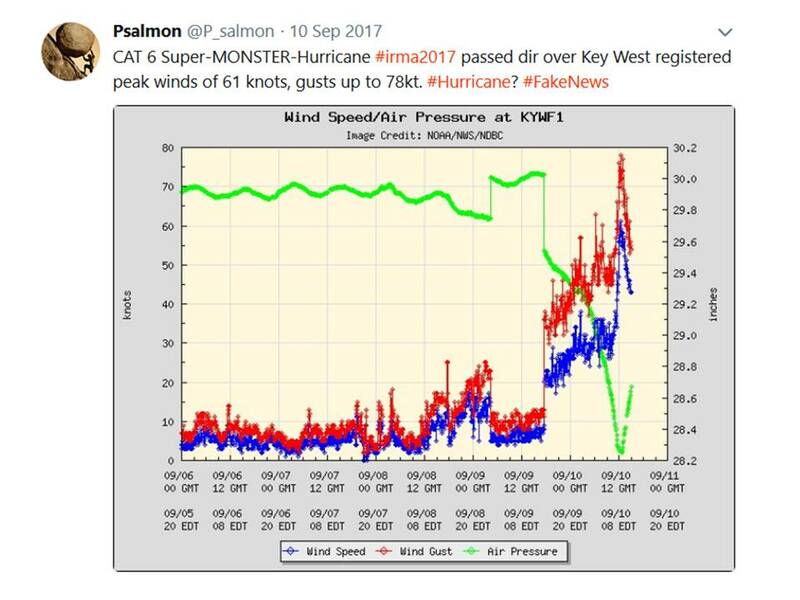 Below is “SUPERSTORM” Cat 4 Irma from last year…Nowhere can you find sustained winds over 75mph except maybe Marco Island near Naples where damage and 75-90mph winds were consistent…but officially it was a “major” hurricane. God help us if a REAL hurricane actually hit the US nowadays. Great observation. One more example of how the goal posts keep moving. Wind on the ground, wind at altitude — what do they care as long as they get to post a panic headline and grab a few more readers to justify the advertising rates? Posting this sitting in my truck at a loading dock in Dexter, MO. 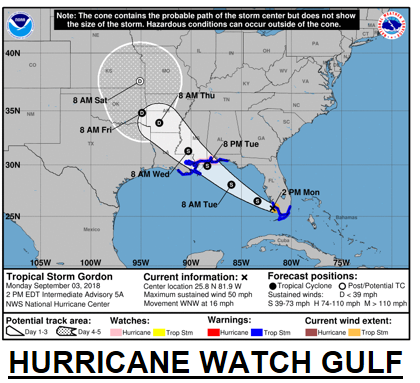 Gordon is now forecast to be a hurricane when it makes landfall somewhere in the vicinity of Biloxy, MS. Hope someone can monitor the buoy and surface station data because Hurricane Hunter data wind speed data has been significantly inflated of late. Incidentally Joe Bastardi reported on Twitter that the latest Hunter max winds data was 40kt…Oh the humanity. Definitely worth top headline of Drudge (who yes when over to the Dark Side just before all the online censorship began. Regarding Drudge, yes, but you have to wonder, did they show him a carrot, or a stick? Was he offered fame and wealth, or was his family threatened? Be thankful, no ten year old boy involved for a change. So even the hurricane hunters couldn’t make Gordon a hurricane. But Florence is on the horizon and THAT is and has been the storm that should be watched carefully for most people. So put your guesses in. Hit or no hit? If hit, approximately where does she come ashore? My guess is HIT as a major on the outer banks of NC. Gordon was a very sudden growth over the last few days and wasn’t really expected to be a hurricane. Florence is a totally different case, hence ‘F’, I suspect you’re right about the outer banks, although it’s still far out and possibly could swing further north.